Half of registered voters think that President Donald Trump is encouraging politically motivated violence in the United States in the way he speaks, but essentially as many say the media are doing the same in the way they report the news, according to an ABC News/Washington Post poll. Just two in 10 say Trump is acting to discourage violence; 15 percent say the media are. The national survey, which comes during a period of heightened tensions ahead of the midterms, also finds the Democratic Party leading the Republicans in trust to handle “reducing divisions between people and groups,” by a substantial 15-point margin, 46-31 percent. Seventeen percent volunteer that they don’t trust either party, a high level for this response. Sixty-nine percent in this poll, produced for ABC by Langer Research Associates, call reducing the country’s divisions a highly important issue in their vote for Congress next week. • Forty-nine percent say the way Trump speaks encourages political violence, while a mere 19 percent see him as discouraging it. Twenty-nine percent say he’s neither encouraging nor discouraging violence – a subject on which neutrality is not a positive attribute. • Trump, for his part, has blamed the media for contributing to “anger and division” in the country, and 47 percent in this survey say the way the media report the news encourages politically motivated violence. Only 15 percent say the media are discouraging such violence; 33 percent say they’re neither encouraging nor discouraging it. Sixteen percent see fault on both sides; they say both Trump and the media encourage violence. Views on Trump and the media are highly partisan. 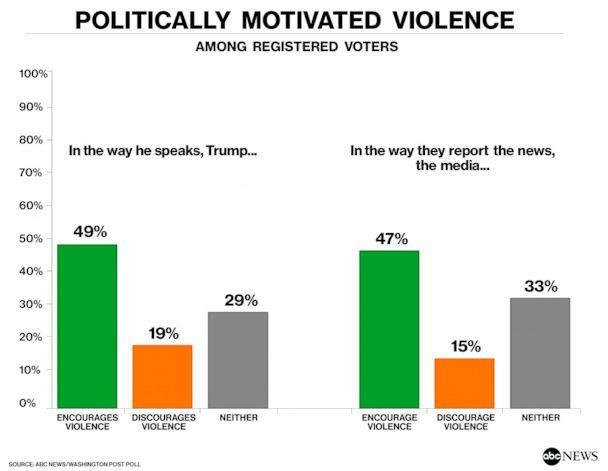 Seventy-six percent of Democrats say Trump encourages violence in the way he speaks; 19 percent of Republicans agree. Even among Republicans, though, just one-third say Trump’s approach discourages violence. The White House, for its part, called it "outrageous" to blame the president for the synagogue attack and mail bomb spree and Trump suggested the media was to blame for the anger in the country. On the media, these numbers are essentially reversed: Sixty-nine percent of Republicans say the way the media report the news encourages politically motivated violence; 24 percent of Democrats agree. Just 19 percent of Democrats say the media discourage violence, similar to the share of Republicans who say so. In the middle, as is typical, are political independents: Half see blame for Trump, and half also see blame for the media. Divisions between conservatives and liberals are similar to what they are among Republicans and Democrats. In the sharpest difference, 83 percent of liberal Democrats say the way Trump speaks encourages violence, while just 17 percent of conservative Republicans agree. And 74 percent of conservative Republicans think the way the media report the news encourages violence, while only 16 percent of liberal Democrats see it that way. In another sharp division, 68 percent of blacks see Trump as encouraging violence in the way he speaks; many fewer whites, but still 45 percent, say the same. And 51 percent of whites see the media as encouraging violence in the way they report the news; that falls to 30 percent of blacks. On the question of trust to handle reducing divisions between people and groups, partisan and ideological divisions again are quite sharp, but the Democrats are notably competitive in some groups. In red states, those that backed Trump in 2016, 41 percent of registered voters pick the Democratic Party as better to reduce divisions, while 36 percent choose the GOP. Among white Catholics, a group Trump won by 23 percentage points in 2016, it’s 43-39 percent. In districts in which congressional seats are in play, it’s 44-35 percent. And in suburban areas it’s 46-30 percent. Eighty percent of Democrats call reducing divisions highly important in their vote; so do 68 percent of independents, and 61 percent of Republicans – lower among Republicans than in all but two groups, college-educated white men and “somewhat” conservatives. This ABC News/Washington Post poll was conducted by landline and cellular telephone Oct. 29-Nov. 1, 2018, in English and Spanish, among a random national sample of 1,255 adults, including 1,041 registered voters. Results have a margin of sampling error of 3.5 points for the sample of registered voters, including the design effect. Partisan divisions are 32-25-35 percent among all adults, and 33-27-34 percent among registered voters, Democrats-Republicans-independents.